WASHINGTON -- Reducing America's huge trade deficits would deliver stronger economic growth and improve national security, the White House trade adviser said, in a speech that underscored the Trump administration's harsh view of recent U.S. trade policies. Speaking at a National Association of Business Economics conference, Peter Navarro argued Monday that China and other trading partners use the proceeds from export sales to buy U.S. companies and technology, reducing America's self-reliance. He says, for example, that only one U.S. company is capable of repairing the propellers on Navy submarines. "Might we lose a broader cold war for America's freedom and prosperity, not by shots fired but by cash registers ringing?" Navarro said. "Might we lose a broader hot war, simply because we have sent our manufacturing and defense industrial base off-shore." 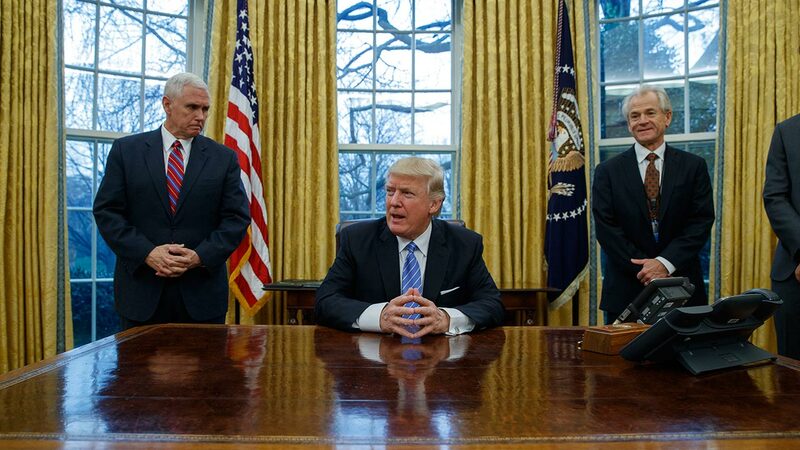 President Donald Trump named Navarro, a University of California-Irvine economist, to lead a new White House council on trade. The appointment signaled Trump's intention to shake up relations with China. Navarro is a sharp critic of Chinese economic and military policies. Navarro's views on the trade deficit stand in stark contrast with mainstream economists, a difference he seemed to relish in his remarks. Most economists see trade deficits as an outcome of a nation spending more than it saves, rather than the result of bad trade deals. They worry that the measures pushed by Navarro, such as higher tariffs, would raise prices for imports of consumer goods such as clothes, toys and electronics. They also warn that it could spark retaliatory measures that would harm U.S. exports. Navarro on Monday said mainstream economists underestimated the damage caused by massive trade deficits. Last year, the United States exported $1.45 trillion in goods and imported $2.19 trillion, creating a trade deficit of more than $734 billion in goods, almost half of it with China. He said the Trump administration would reduce trade deficits by negotiating better trade agreements and reducing corporate tax rates and regulations to make American companies more competitive. Navarro waved away the argument that cracking down on imported goods would raise prices for American consumers. He says "modest inflation" would be a worthwhile price to pay for saving and creating U.S. jobs. "This seems to be an elitist out-of-touch argument, as it assumes that the poorest segments of our society would rather have cheap products than a good job, and a good paycheck," he said. Navarro described his job as leading a "SWAT team" in the White House that helps U.S. companies contend with unfair trade practices abroad and burdensome regulations at home. His remarks also sketched out the full ambition of Trump's trade policies. For example, Navarro said the administration wants to encourage more companies to make or source their parts in the United States, rather than simply assembling foreign made parts in the U.S.
"One of the major goals of the Trump administration is to reclaim all of the supply chain and manufacturing capabilities that would otherwise exist if the playing field were level," Navarro said. Yet this could be a tall order: Many large U.S. corporations source parts from dozens of countries around the world, a result of decisions made over decades. Boeing, for example, uses parts from 90 countries. Glenn Hubbard, who served as George W. Bush's top economic adviser, said during a press briefing at the conference that forcing the relocation of supply chains "would be very disruptive." "I don't think business people are comfortable with that," Hubbard added. Doug Elmendorf, former director of the Congressional Budget Office and a former Clinton administration official, said that Trump's proposed tax cuts and deregulatory agenda could accelerate the economy's growth. But the administration's trade policies could offset those benefits. "Their approach to trade policy is one thing that will lower growth," Elmendorf said.